Here’s a fun way to punch up your cast on edges. I loved the idea of adding a contrasting color at the very beginning of a project. However, once I started experimenting, I found that a 2-color cast on isn’t as straight forward as you might think. That’s because a cast on can’t just look good — it has to work well too. We need flexibility at the bottom of sweaters, cuffs, hat brims and on lacy edges but my first cast on experiments were too rigid. Back to the drawing board and to the invention of a Nuance we’ve already announced – the basic Resilient Cast On. One of the reasons I love the Resilient Cast On is because it’s not just a pretty face. The nubby edge of the 1-color Resilient Cast on is pretty to look at and adds give to edges allowing them to curve nicely with your stitch pattern. 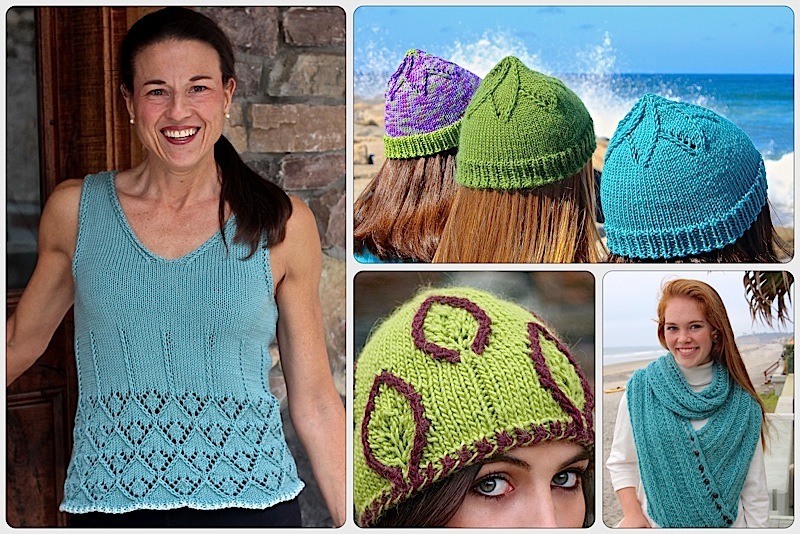 You can try it in the Fiftyfifty and Caliente Shells or Tranquility Shawl. The 2-color version of the Resilient Cast On starts the same way, with 1/3 more stitches than working stitches; 2 of the contrasting color and 1 of the main color. 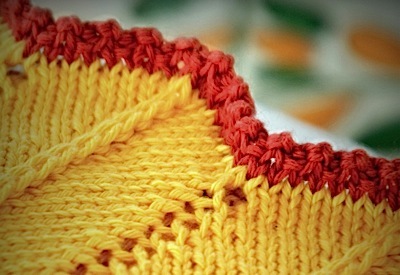 One CC stitch is passed over the other resulting in alternating MC and CC stitches. Interestingly, this 2-color version does not have the same nubby edges as its 1-color sibling, but a nice smooth edge that highlights the alternating colors. You’ll be seeing more of this Nuance in some upcoming projects. Free Tutorial Download: As always, a free tutorial download is available on our web site. **New** There is a video how to on our new You Tube channel. Want to learn about more Nuances? Follow the blog or sign up for our Quarterly Newsletter and you’ll be the first one to know what’s up next. This entry was posted on September 12, 2014 by Laura Cunitz in Edges, Nuances, Videos and tagged Knit Cast On, Nuances, Resilient Cast On.